Location: Gundahoo River Outfitters BC is situated in Fort Nelson offering the finest hunting packages in BC, Canada. About your host at Gundahoo River Outfitters Bc: Quintin Thompson, Owner. Gundahoo River Outfitters since starting its operation in 1987 has been one of the most successful areas for trophy hunting. The Stone’s sheep that inhabit ou r area are the true Stone’s, coloration can vary from salt & pepper an d chocolate bodies to almost black. For this reason, the Stone Sheep blend into their landscape, making them almost impossible to see but to the trained eye. We only offer 14 day hunts for sheep, as this is a mountain hunt and weather is the determining factor in how many hunting days you may have. 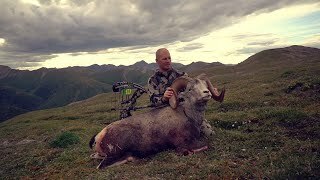 We start hunting Sheep Aug 1st (opening season for sheep) during this hunt, hunters who want to only focus on sheep book this time frame, or we recommend this time frame for Archery Hunters as well. This first hunt includes three days of pre-scouting with guide. The second hunt which starts August 13th can also include other species once your primary tag, Stone Sheep has been harvested. Ani mals that can also be hunted include Canadian Moose (opens Aug 15th) Mt Caribou (Aug 15th) Mt Goat (Aug 25th) Grizzly (Aug 15th) Wolf can be hunted any time and with your complimentary tag that GRO provides, it is a wonderful opportunistic trophy! All additional animals harvested are on a harvest fee. Hunting experience at Gundahoo River Outfitters Bc: Gundahoo River Outfitters has long been known for its quality trophy animals, it is a unique area with more than one premier wildlife species. Stone’s Sheep, Canadian Moose, Mt Caribou, Mt Goat, Mt Grizzly are all quality huntable species. Our exclusive guide area encompasses 3,328,000 acres in the Terminal Range of the Rocky Mountains. We offer a hunt that will transport you back in time, a time of plentiful game, majestic scenery of an untouched landscape. Our staff is professional and experienced and ready to provide the Wilderness Experience of a Lifetime! Click here for quick link country guide. 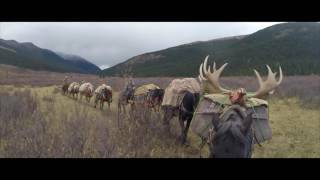 Hunting License	- $180.00	Trophy Rates : Sheep Tag - $620.00 Moose Tag - $250.00 Caribou Tag - $230.00 Mt Goat Tag - $350.00 Elk Tag - $250.00 Grizzly Bear Tag - $1030.00 Black Bear Tag - $180.00 A 50% non-refundable deposit is required to confirm all bookings. If the hunter finds a replacement the deposit is transferable. The balance of the contracted hunt price is due May 1 st of the year the hunt is to take place. Methods of payment, cash, personal checks, travelers checks, bank draft or bank wire. All rates are in US$funds. Contact us for a current rate schedule. We also reserve the right to add a “fuel surcharge” to cover extreme rises in fuel prices between the time you book and the hunt date. When booking a trip more than one year in advance the contracted rate will not be guaranteed till one year in advance of trip, if the basic hunt rate has increased, the client shal l have the opportunity to withdraw from the contract with full deposit refund. -Harvest Fees Due and Payable at end of hunt as per hunting package agreement. -Wounded animal constitutes a harvest fee. To select and book the top suggested hotels and accommodation in the area when hunting at Gundahoo River Outfitters Bc click here. by car or public transport to Gundahoo River Outfitters Bc.